Includes a source of microbes. Delayed bioavailability; traditional manures can take up to 5 years for the nutrients within to breakdown to a form usable by plants and lawns. Weed seeds suspended in manure can sprout and grow, causing you more work in your lawn care and potentially robbing nutrients from your garden. Elevated salt levels can lead to increased toxicity in your soil and inhibit plant and turf growth. Heavy bags with messy contents, along with the need to spread and till the manure in order to reach the root zone, add unnecessary labor to your gardening and lawn care efforts. Trace amounts of pesticides from animal feed can wind up in the manure and add toxicity to your lawn or garden. What if there was a way to get the benefits of manure without the negatives? 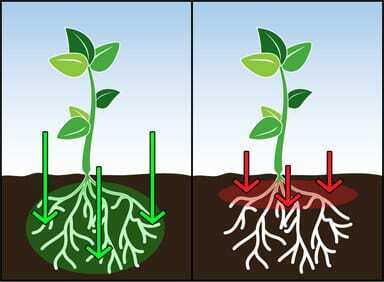 After mixing our concentrated formula with water, the mixture can easily penetrate soil and reach the entire root zone of a plant. When using just manure or another dry medium, only the top of the root zone can absorb any beneficial nutrients. Great Big Plants has developed products that are able to deliver the benefits of manure, while providing additional resources to help plants, lawns and soil thrive. Immediate bioavailability – thanks to beneficial microbes and liquid formulation, our liquid products flow freely to the root zone delivering macro and micronutrients in a form already usable by your garden. Ease of use – the liquid concentrate is added to a watering can or sprayer in order to create a ready to use product. Our dry-blend can be broadcast or tilled into containers or beds. Increased plant health and yield – our products help boost fertilizers and turbo charge root growth for lawns and plants, resulting in a stronger root architecture and better ability to uptake nutrients. No weed seeds, excessive salts or pathogenic microbes. Natural and organic certified products.